Accepted Scientific Name: Opuntia leucotricha DC. Mém. Mus. Hist. Nat. 17: 119. 1828. 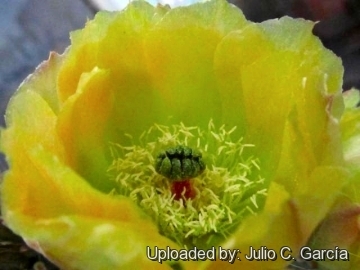 Origin and Habitat: Opuntia leucotricha is a widely distributed species across the Altiplano of central Mexico, where it occurs in the states of Aguascalientes, Guanajuato, Hidalgo, Jalisco, Nuevo León, Querétaro, San Luis Potosí, Tamaulipas and Zacatecas. It is used and cultivated in Mexico and in the Mediterranean as forage for animals and as food for humans and often sub-spontaneous after cultivation. The plant is an invasive species in Florida. Altitude range: Between 1500 and 2500 metres above sea level. Habitat and Ecology: This cactus occurs in xerophyllous scrub and matorral with an annual rainfall ranging from 220 to 450 mm/annum. It form large shrubs and maintains a good population of perennial grasses under its canopy. This species is widespread and relatively abundant though with irregular distribution and variable density. There are no major threats to this species, but some of the wild populations have been affected by the continuous increase in the cultivated area of maize and dry beans. Opuntia leucotricha var. fulvispina F.A.C.Weber in K.Schum. Opuntia fulvispina Salm-Dyck in Pfeiff. 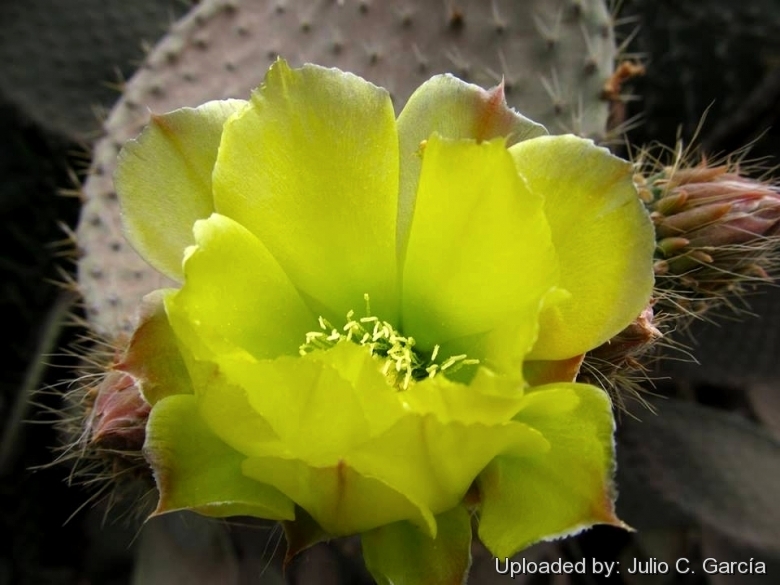 Description: Opuntia leucotricha (Duraznillo) is a jointed shrubby cactus forming clumps or small trees with distinct trunks and a large top often 3 to 5 meters high. Flowers are deep yellow with white stamens and deep red stigma with green lobes. Fruit is fragrant whitish-yellow ( Duraznillo blanco) or red ( Duraznillo colorado), have a good taste and can be found in Mexican markets. Stems: Trunk as well as the older joints covered with long white bristles. Cladodes (joints) oblong to orbicular, 10 to 25(-30) cm long and to 12 across, pubescent. In particular, the newly developing cladodes of Opuntia leucotricha tended to become flattened in a direction perpendicular to a light beam, thereby intercepting more of the light compared with a random orientation of the cladodes. Areoles: Numerous, closely set, small, to 1 cm apart. the upper part filled with yellow glochids, the lower part at first with only 1 to 3 flexible white spines, one much longer, to 3 cm. Flowers: Yellow, 4 to 5 cm. long (including ovary), 4-8 cm in diameter. Petals yellow, broad. Pericarpel with numerous areoles, the upper ones bearing long, bristly glochids (ca. 1 cm. long). Style red, stigma-lobes green. Fruit: Variable, globose, 4 to 6 cm long, white or purple, the rind not easily coming off from the pulp, aromatic, edible. 1) Gómez-Hinostrosa, C., Sánchez , E., Guadalupe Martínez, J. & Bárcenas Luna, R. 2013. Opuntia leucotricha. The IUCN Red List of Threatened Species. Version 2014.2. <www.iucnredlist.org>. Downloaded on 13 August 2014. 12) Allorge-Boiteau, L. “Les cactées introduites à Madagascar.” Succulentes (France) 25(1): 9–16.2002. 13) Anonymous. 1986. "List-Based Rec. ", Soil Conserv. Serv., U.S.D.A. Database of the U.S.D.A., Beltsville. 14) CONABIO. 2009. "atálogo taxonómico de especies de México." 1. In Capital Nat. México. CONABIO, Mexico City. 15) Small, J. K. 1933. "Man. S.E. Fl." i–xxii, 1–1554. Published by the Author, New York. 16) Wunderlin, R. P. 1998. "Guide Vasc. Pl. Florida" i–x, 1–806. University Press of Florida, Gainseville. 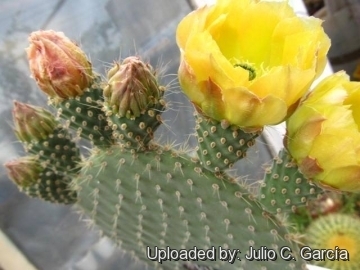 Cultivation and Propagation: Opuntia leucotricha is a hardy cactus easily found in cultivation. It is a summer grower species that offers no cultivation difficulties. Hardiness: It is a quite frost resistant cactus, hardy to -7° C or less if very dry). However in cultivation it is better not to expose it to temperatures lower than -0° C, even if in an aerated and protected location, in order to avoid the formation of anti-aesthetic spots on the epidermis. In presence of high atmospheric humidity avoid any frost as it is particularly sensitive to root rot. USDA Zone 7-10. It can handle extremely high temperatures in summer.